Market Technical View: EUR-USD analysis. Reversal time. 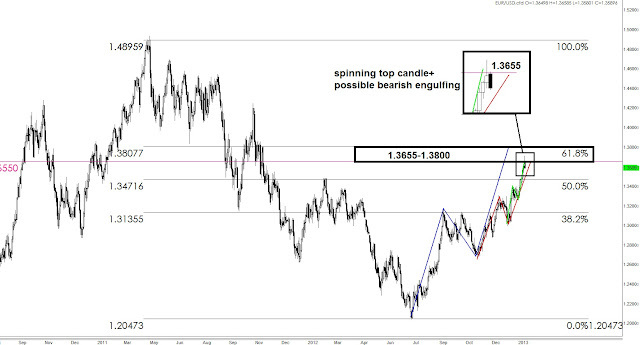 The daily chart of the EUR/USD cross reveals a bunch of clues for a mid-term reversal. The strength of the Euro from late July until now has evolved in 3 waves (ABC structure) and it almost reached the 61.8% Fibonacci retracement of the May 2011 - July 2012 swing down. Moreover, there are 3 AB=CD scenarios on different time scales (blue, red and green lines on the chart) that are projecting the target in the same area 1.3655 - 1.3770. In Friday's session the price formed a spinning top candle and today it seems that the bears are dominating. In case the EURUSD cross will close the day somewhere below 1.3600 level, than a bearish engulfing pattern will be created and we should look for a reversal.